Noe Valley: As seen on the note on the door (via the Noe Valley Blog), there are changes afoot at Belgano Chocolatier Gelateria. The coy, cheesy note only promises that "refreshing new embellishments have been added, including delicious surprises." But that Pinkberry-esque fruit logo sure looks familiar, doesn't it? 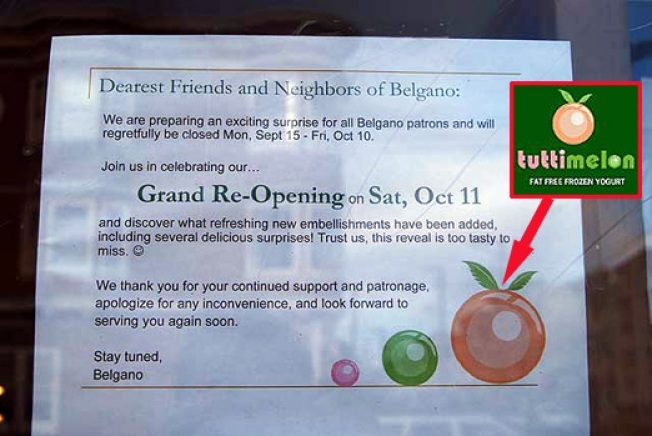 Sure enough, little does 24th Street know that Belgano won't be returning on October 11, because yet another branch of Tuttimelon and its frozen yogurt are on the way in Belgano's stead. And so the froyo trend stakes a claim in another neighborhood.